Week 3, day 2 of My Eating Well Challenge. When people ask, “If you were stranded on a desert island and could only have one food, what would it be?” I often think my answer would be pizza. Between the dough, the sauce, and the toppings, the variations are practically endless. I am also not prejudiced in favor of any one particular style. Although I am particularly fond of the thin-crust style I grew up with in Brooklyn, I can appreciate deep-dish, stuffed, and most variations of toppings. This recipe has intrigued me since I first read it. According to EatingWell, adding pumpkin puree to the sauce increases fiber and beta carotene, but what about the taste? It turns out it’s quite good. One wouldn’t notice unless they were looking for an odd ingredient, they’d just think it’s a relatively sweet sauce. When I questioned my family, they guessed sweet potato. I believe adding a bit of salt to the sauce would balance the flavor. The recipe also features a favorite secret ingredient of mine: Turkey pepperoni. I am generally disappointed by “replacement” foods, but turkey pepperoni is an exception. When cooked, its flavor is nearly identical to the pork and beef version, but has significantly less fat. This pizza is certainly no replacement for my beloved Fascati or Grimaldi, but it’s a very good, satisfying pizza that can be prepared quickly. I’m sure little kids would love this recipe (and they can help make it, too). 1. Place oven rack in the lowest position; preheat to 450°F. Coat a large baking sheet with cooking spray. 2. Roll out dough on a lightly floured surface to the size of the baking sheet. Transfer to the baking sheet. Bake until puffed and lightly crisped on the bottom, 8 to 10 minutes. 3. Whisk pumpkin puree, tomato sauce and garlic powder in a small bowl until combined. 4. Spread sauce evenly over the baked crust. Top with mozzarella, Parmesan and pepperoni. Bake until the crust is crispy on the edges and the cheeses have melted, about 12 minutes. Week 2, day 4 of My Eating Well Challenge. In 1990, there was a film about an advertising executive whose “truthful” campaigns are accidentally published. One of those was for Volvo: “They’re boxy, but they’re good.” This is exactly the thought I had when I tasted the meatloaf, due to its compact, rectangular shape. I have made this recipe using muffin tins, but I found the small loaf shape is more attractive for serving and makes for more evenly cut slices for sandwiches. You will be absolutely stunned at how quickly the recipe comes together. Turkey meatloaf tends to be dry, but this recipe is particularly moist thanks to the vegetables and couscous, and just a touch spicy from the mustard and Worcestershire. Ignoring the color, one does not miss the beef at all. I replaced the optional barbecue sauce with Heinz chili sauce, as I prefer the tomato flavor with meatloaf. They reheat perfectly, making a satisfying lunch the next day. 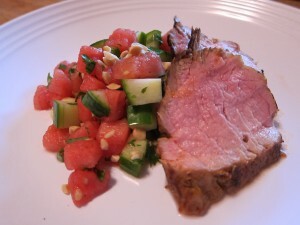 View the recipe and nutritional information on EatingWell.com. 1. Preheat oven to 400°F. Generously spray a nonstick muffin pan with cooking spray. 2. Gently mix turkey, zucchini, onion, bell pepper, couscous, egg, Worcestershire, mustard, pepper and salt in a large bowl, preferably with your hands, without overworking. Equally divide the mixture among the muffin cups. Spread barbecue sauce on top of each loaf, if using. 3. Bake until the meatloaves are cooked through or an instant-read thermometer inserted into the center registers 165 degrees F, about 25 minutes. Let the loaves stand in the pan for 5 minutes before serving. Week 1, Day 3 of My Eating Well Challenge. I like to eat vegetarian a few days a week, but vegetarian main dish entrees can become boring without some inspiration. While this is not the most creative entree, it has some very nice flavor reminiscent of many Italian style dishes I’ve had, and the greens make the stuffing substantial and flavorful. 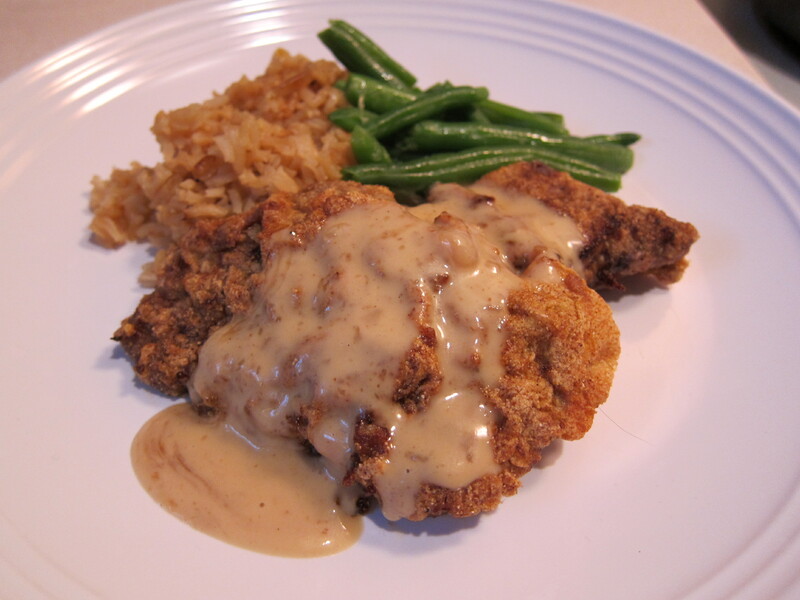 I substituted mustard greens, as they were in better condition than the kale at my market. 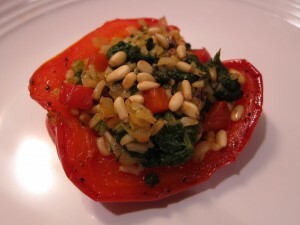 Although light on their own, the peppers make a filling dish when served with a side salad. One thing to note, keep a watch on the peppers when roasting them. I let them go a little too long and my pepper bowls nearly became pepper plates. View the recipe and nutrition information at EatingWell.com. You can vary the filling by substituting robust mustard greens or collards, or milder greens, such as spinach, escarole or Swiss chard. 1. To prepare peppers: Preheat oven to 400°F. Halve peppers lengthwise through the stems, leaving them attached. Remove the seeds. Lightly brush the peppers outside and inside with oil; sprinkle the insides with salt and pepper. Place, cut-side down, in a 9-by-13-inch baking dish. Bake until peppers are just tender, 10 to 15 minutes. Let cool slightly. Turn cut-side up. 2. To prepare filling: Bring 2 cups salted water to a boil in a large wide pan. Stir in kale, cover and cook until tender, 10 to 12 minutes. Drain, rinse under cold water; squeeze dry. Finely chop. 3. Heat oil in a large nonstick skillet over medium heat. Add onion and chopped bell pepper; cook, stirring often, until onion is golden, 6 to 8 minutes. Add garlic and cook, stirring, for 30 seconds. Stir in the kale. Remove from the heat and let cool slightly. Stir in rice, Parmesan, 2 tablespoons pine nuts and lemon juice. Season with salt and pepper. Divide the filling among the pepper halves. Sprinkle with the remaining 2 tablespoons pine nuts. 4. Add 2 tablespoons water to the baking dish. Cover the peppers with foil and bake until heated through, 15 to 20 minutes. Uncover and bake for 5 minutes more. Serve hot. 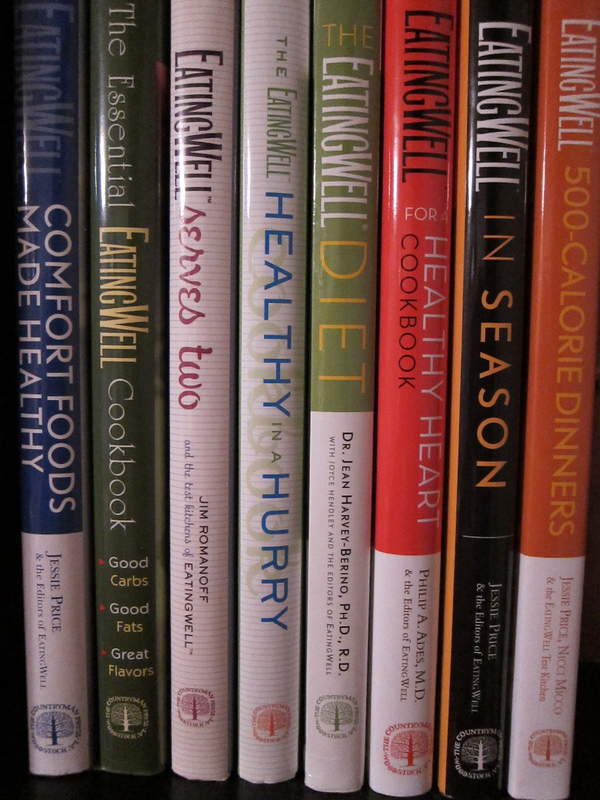 I know I said I’d cook more using recipes from my vast collection of cookbooks, but it was just one of those days. At work, tired, wanting something healthy and delicious to eat for dinner, but not wanting to cook. I knew I needed something to blog about, but whatever; the blog post could wait. I was thinking perhaps I’d pick up a rotisserie chicken from the local rotisserie chicken place or from Whole Foods and be done with it. No pans to clean, no carving, no hassle. 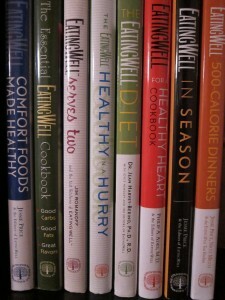 That’s when I ran across a blog post by Michael Ruhlman, “America: Too Stupid To Cook,” and hung my head in shame. Which brings me to my point. Left to their own devices with only an oven and a piece of meat, I’m pretty sure anyone can figure out that they need to turn the oven on and put the meat inside the oven to cook it. But because people are hammered by TV, websites, magazines, and cookbooks with a million techniques, they become frightened and don’t cook at all. A million questions are then asked: What temperature do I cook the meat? It doesn’t matter much – either a low temperature for a long time or a higher temperature for a shorter time. Do I need to marinate? Nice, but not necessary. What about seasonings? Salt and pepper do just fine. When is it done? When it is cooked. Really, stop worrying! Block out the noise in your head. Do what feels right. Our grandparents did not have the luxury of meat thermometers, or ovens that told (or even held) an actual temperature, or a bookstore filled with hundreds of cookbooks, or exotic ingredients just a click away. They simply put real food on the table. That’s what we should aspire to. To continue with the story of the chicken, my personal shame after reading Mr. Ruhlman’s article came not from a feeling that I couldn’t cook. My shame came from knowing that I can cook a perfectly delicious, healthy meal, without much trouble, and that I was choosing not to because I was tiiirrreeed. I’ve been choosing to do this for most of my adult life, and I should have learned by now that this is a terrible waste on so many levels. 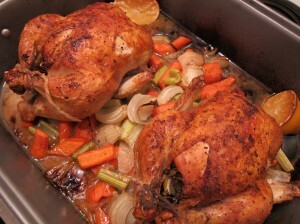 Don’t get me wrong, if you’re going to go the fast-food route, a rotisserie chicken is possibly one of the best options. But for me, someone with easy access to good ingredients, who knows how ridiculously simple it can be to roast a chicken, it seemed silly. I was about to spend too much money for too little food, with questionable nutritional value, for poultry that was probably raised in a factory. I decided I would get over myself and roast a chicken. 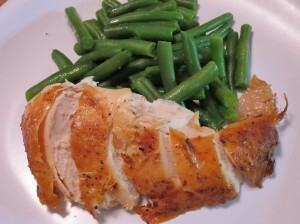 As soon as I arrived home, before I even changed my clothes, I turned the oven to 475 degrees F.
I put the roasting pan with the vegetables and the chickens into the oven and immediately turned the temperature down to 400 F.
While the chickens were lying about, I put a bag of frozen green beans in the microwave to steam per the directions, dumped them in a bowl with a bit of butter and salt. Ultimately, the only thing you *need* here is an oven, a chicken, a roasting pan, and some salt and pepper. I know some people would not use salt at all, but that’s completely against my culinary principles. If you want to make things complicated, possibly the best roast chicken I’ve ever made was the one from the Zuni Cafe Cookbook. You can see an adapted recipe here. 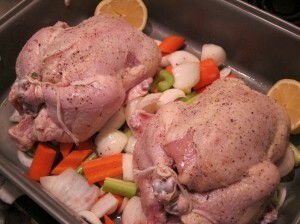 This will require salting the chicken a day ahead, preheating a pan, searing the breast, etc. It is not difficult, and it’s definitely worth cooking, but it’s not necessarily something I’d want to tackle during the week. The next evening I made chicken salad from the second chicken. This cranberry walnut version is a delicious recipe that takes only a few minutes to make. Chicken salad is super easy – it’s just diced chicken tossed with a perked-up mayonnaise dressing. Two days later I made chicken stock. I pulled the skin/fat off the backs of the carcasses, cut some carrot, celery, and shallot (I didn’t have onions) into pieces, bundled some thyme and a bay leaf, put it all in a pot and covered it all with cold water. I left it on a high simmer for three hours. Because we did such a good job eating the chicken, there was very little protein or fat to skim off. I would up with four quarts of beautiful chicken stock! Two chickens, several meals, and a valuable lesson learned. It truly didn’t take much effort to feed me and my family a few wholesome meals, and it cost significantly less money than take-out. So while I’ll continue with the cookbook experiment, you’ll definitely be seeing these toss-it-together weeknight recipes as often.